That Bolton’s bellicose statements do not send shockwaves of pure horror across a debt-strapped and war-weary United States is thanks in large part to incessant priming for war, facilitated by corporate media across the entire political spectrum, with a particular focus on Iran. Back in 2015, while current “resistance” stalwarts like the Washington Post (4/2/15) and Politico (8/11/15) warned us that war with Iran was the most likely alternative to the JCPOA, conservative standard-bearers such as Fox News (7/14/15) and the Washington Times (8/10/15) foretold that war with Iran was the agreement’s most likely outcome. Three years hence, this dynamic has not changed. Trump’s latest antics at the United Nations have spurred a wave of similar reaction across corporate media. Describing his threat to “totally destroy North Korea” at the UN General Assembly last year as “pointed and sharp,” Fox News anchor Eric Shawn (9/23/18) asked Bill Richardson, an Obama ally and President Bill Clinton’s ambassador to the UN, whether Trump would take the same approach toward Iran. “That aggressive policy we have with Iran is going to continue,” Richardson reassured the audience, “and I don’t think Iran is helping themselves.” In other words, if the United States starts a war with Iran, it’s totally Iran’s fault. Politico (9/23/18), meanwhile, reported that Trump “is risking a potential war with Iran unless he engages the Islamist-led country using diplomacy.” In other words, if the United States starts a war with Iran, it’s totally Trump’s fault. Rice (New York Times, 9/26/18) reiterated her view that Trump’s rhetoric “presages the prospect of war in the Persian Gulf.” Whoever would be the responsible party is up for debate, but that war is in our future is apparently all but certain. Politico’s article cited a statement signed by such esteemed US experts on war-making as Madeleine Albright, who presided over Clinton’s inhuman sanctions against Iraq in the ’90s, and Ryan Crocker, former ambassador for presidents George W. Bush and Obama to some of America’s favorite killing fields: Iraq, Afghanistan, Pakistan and Syria. James Clapper, Obama’s National Intelligence Director, who also signed the letter, played an important role in trumping up WMD evidence against Saddam Hussein before the United States invaded Iraq in 2003. When it comes to US aggression, they’re the experts. Vanity Fair (9/26/18) interviewed John Glaser of the Cato Institute, who called Trump’s strategy “pathetic,” and also warned that it forebodes war. In an effort to “one-up Obama,” Glaser explained, Trump’s plan is “to apply extreme economic pressure and explicit threats of war in order to get Iran to capitulate.” Sound familiar? As Glaser implies, this was exactly Obama’s strategy, only then it wasn’t seen as “pathetic,” but rather reasonable, and the sole means for preventing the war that every US pundit and politician saw around the corner (The Hill, 8/9/15). When everyone decides that war is the only other possibility, it starts to look like an inevitability. But even when they aren’t overtly stoking war fever against Iran, corporate media prime the militaristic pump in more subtle yet equally disturbing ways. First among these is the near-complete erasure of Iranian voices from US airwaves (FAIR.org, 7/24/15). 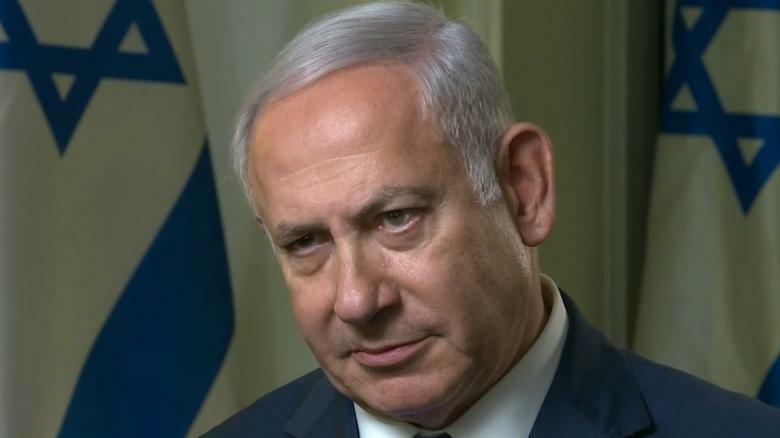 Rather than ask Iranians directly, national outlets like CNN (9/29/18) prefer to invite the prime minister of Israel, serial Iran alarmist and regional pariah Benjamin Netanyahu, to speak for them. During a jovial discussion this weekend over whether regime change and/or economic collapse is Iran’s most likely fate, Netanyahu explained to the audience that, either way, “The ones who will be happiest if that happens are the people of Iran.” No people of Iran were on hand to confirm or deny this assessment. Another prized tactic is to whitewash Saudi Arabia, Iran’s chief geopolitical rival, whose genocidal destruction of Yemen is made possible by the United States, about which corporate media remain overwhelmingly silent (FAIR.org, 7/23/18). Iran’s involvement in Yemen, which both Trump and the New York Times (9/12/18) describe as “malign behavior,” is a principal justification for US support of Saudi Arabia, including the US-supplied bombs that recently ended the brief lives of over 40 Yemeni schoolchildren. Lockheed Martin’s stock is up 34 percent from Trump’s inauguration day. Corporate media go beyond a simple coverup of Saudi crimes to evangelize their leadership as the liberal antidote to Iran’s “theocracy.” Who can forget Thomas Friedman’s revolting puff piece for the Saudi crown prince Mohammad bin Salman? Extensively quoting Salman (New York Times, 11/23/17), who refers to Iranian Ayatollah Ali Khamenei as “the new Hitler of the Middle East,” Friedman nevertheless remains pessimistic about whether “MBS and his team” can see their stand against Iran through, as “dysfunction and rivalries within the Sunni Arab world generally have prevented forming a unified front.” Oh well, every team needs cheerleaders, and Friedman isn’t just a fair-weather fan. While Friedman (New York Times, 5/15/18) believes that Trump has drawn “some needed attention to Iran’s bad behavior,” for him pivotal questions remain unanswered, such as “who is going to take over in Tehran if the current Islamic regime collapses?” One immediate fix he proposed was to censure Iran’s metaphorical “occupation” of Syria, Iraq and Lebanon. Isn’t this ironic coming from an unapologetic propagandist for Washington’s decades-long, non-metaphorical occupation of the two countries to the east and west of Iran (FAIR.org, 12/9/15)? I often wonder what would have happened if that coup had not worked, if [Prime Minister] Mosaddeq had been allowed to govern, if democracy had been allowed to flourish. “It is time for the US government to stop intervening in Iran and let the Iranian people determine their own destiny,” she beseeched readers. “How dare you bring up the issue of Yemen,” admonished Benjamin as she was dragged from the room. “It’s the Saudi bombing that is killing most people in Yemen. So let’s get real. No more war! 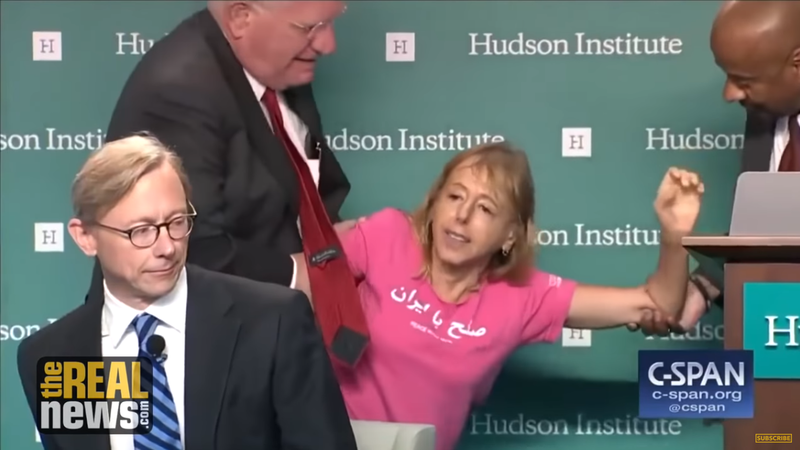 Peace with Iran!” Code Pink is currently petitioning the New York Times and Washington Post to stop propagandizing war. Sadly, no matter whom you ask in corporate media, be they spokespeople for “Trump’s America” or “the resistance,” peace remains an elusive choice in the US political imagination. And while the public was focused last week on Supreme Court nominee Brett Kavanaugh’s perjurious testimony, the Senate finalized a $674 billion “defense” budget. Every single Democrat in the chamber voted in favor of the bill, explicitly naming Iran as persona non grata in the United States’ world-leading arms supply network, which has seen a 25 percent increase in exports since Obama took office in 2009. The US government’s imperial ambitions are perhaps its only truly bipartisan project—what the New York Times euphemistically refers to as “globalism.” Nowhere was this on fuller display than at the funeral for Republican Sen. John McCain (FAIR.org, 9/11/18), where politicians of all stripes were tripping over themselves to produce the best accolades for a man who infamously sang “bomb bomb bomb, bomb bomb Iran” to the tune of a Beach Boys song. 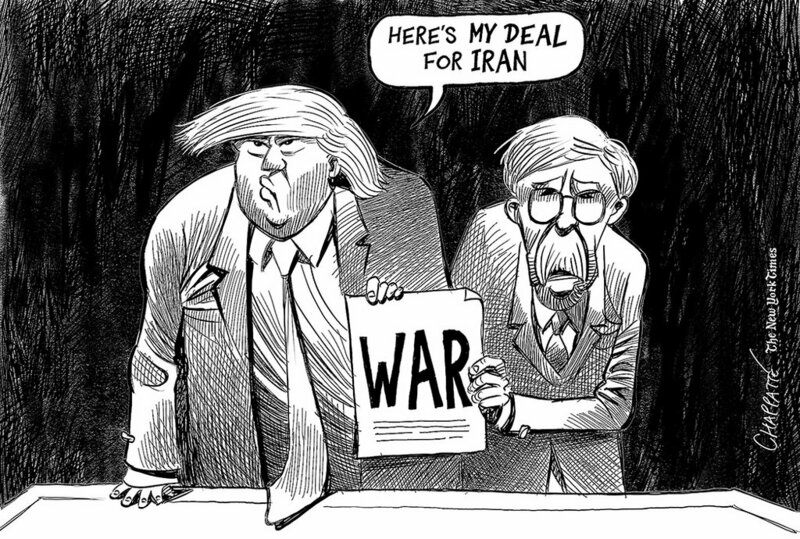 Iranian leaders have repeatedly said they do not want war with the US (AP, 9/27/18), but US corporate media, despite frequently characterizing Trump as a “mad king” (FAIR.org, 6/13/18), continue to play an instrumental role in rationalizing a future war with Iran. Should such an intentional catastrophe come to pass, we can hardly say that this would be America gone mad; war is not aberration, it is always presented as the next sane choice. This is America. John C. O’Day is a graduate philosophy student at Texas A&M.